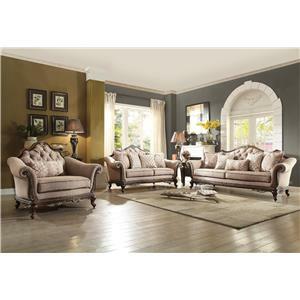 This beautiful sofa presents extended seating and wonderful formal style. 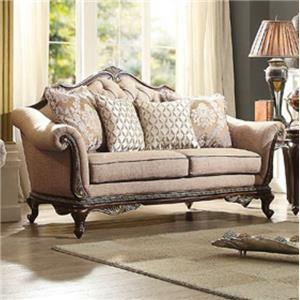 Featuring rolled arms and intricate tall legs, the sofa features a camel shaped tufted back. With two large seat cushions, this sofa will transform your bedroom setting. The Bonaventure Sofa with Tufted Back by Homelegance at Hudson's Furniture in the Tampa, St Petersburg, Orlando, Ormond Beach & Sarasota Florida area. Product availability may vary. Contact us for the most current availability on this product. 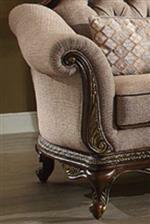 The Bonaventure collection presents beautiful traditional furnishings for your home. 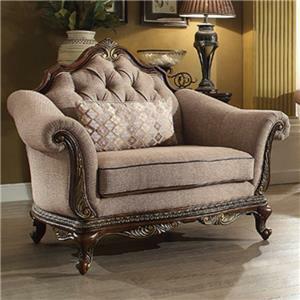 With elegant style details such as tufted backs and intricately-detailed tall legs, the pieces will transform your living room setting with formal style. The Bonaventure collection is a great option if you are looking for Traditional furniture in the Tampa, St Petersburg, Orlando, Ormond Beach & Sarasota Florida area. Browse other items in the Bonaventure collection from Hudson's Furniture in the Tampa, St Petersburg, Orlando, Ormond Beach & Sarasota Florida area.